Be prepared for overnight guests with this Air Coil Mattress Queen Sleeper sofa. 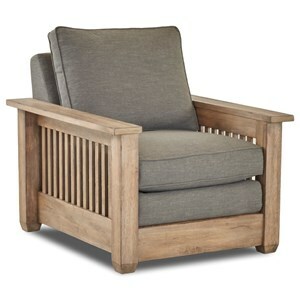 The piece features a two-over-two, straight-lined box cushion design for a more contemporary and casual look, while the slatted wood arms provide that classic mission style. Furthermore, the built-in queen air coil mattress provides a comfortable bed for anyone who needs it. Finally, choose between a wide variety of custom upholstery options to match your space and create the look that suits your personal style best. 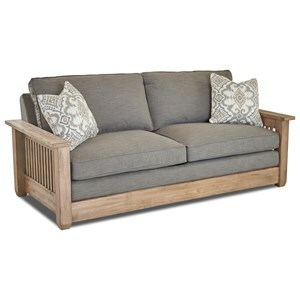 The Glenwood Air Coil Mattress Queen Sleeper Sofa with Mission Style Arms by Elliston Place at Morris Home in the Dayton, Cincinnati, Columbus, Ohio, Northern Kentucky area. Product availability may vary. Contact us for the most current availability on this product. This collection of upholstered living room furniture will give your space a clean and unique style along with some clutch hosting functions. This collection features a number of different sleeper sofa options, each with a different type of mattress, that'll make your house your friends' favorite. The Glenwood collection is a great option if you are looking for Casual Mission furniture in the Dayton, Cincinnati, Columbus, Ohio, Northern Kentucky area. Browse other items in the Glenwood collection from Morris Home in the Dayton, Cincinnati, Columbus, Ohio, Northern Kentucky area.